The first step towards a glowing skin is of course using a good scrub. For the body I prefer anything that has many grains or bigger particles like sea salt. So far I was really satisfied with the Yves Rocher Vanilla Body Exfoliant or scrubs from Aldo Vandini. For the feet a scrub may not be enough which is why I use a pumice stone in the shower regularly. Outside the shower I like to spoil my hands from time to time with a scrub that is moisturising at the same time. You can get these "scrub in oil" solutions or scrub bars with oil, for example at Lush. They are just amazing as you won't need to use a hand cream afterwards. The moisturising is the most time-consuming part of my routine as I use different creams for different parts of my body. As I wasn't spared from cellulite I use my all time favourite Garnier Body Tonic firming lotion on my upper legs. As my lower legs and arms tend to be more dry I prefer to use a 2-in-1 moisturiser and toning cream like for example Nip + Fab's Body Slim Fix. However you can get cheap alternatives at about any supermarket. Finally for the feet I use a super rich cream for cracked skin like for example from Allpresan or Kneipp (preferably in the evening though so I can wear socks until the cream has absorbed). When I have really lots of time in the morning I like to add some more special care to my routine by using oils. My elbows for example won't content themselves with regular lotion, so I sometimes spoil them with coconut oil. Then I also have this special massage tool with knobs which is either made of plastic or wood. You can get it at the drug store or an organic shop for example. When used with oil it easily glides over the skin and so I use it to encourage blood circulation on skin areas with stretch marks. These look great! 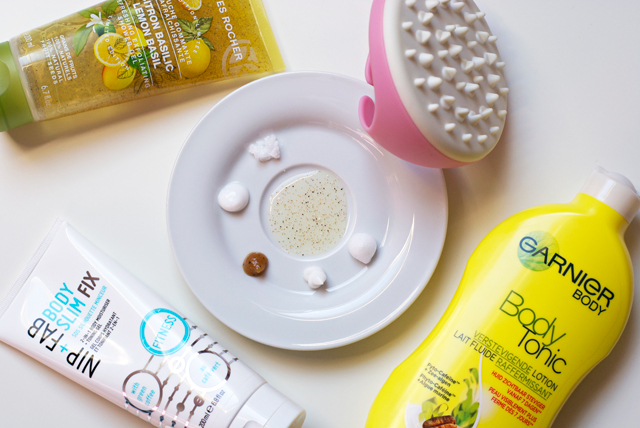 I really want to try the Garnier Baody Tonic! I really should start incorporating essential oils to my skincare routine - it seems like it works so well for you! Also, I'm gonna go look for that Nip + Tuck moisturizer. It looks amazing!